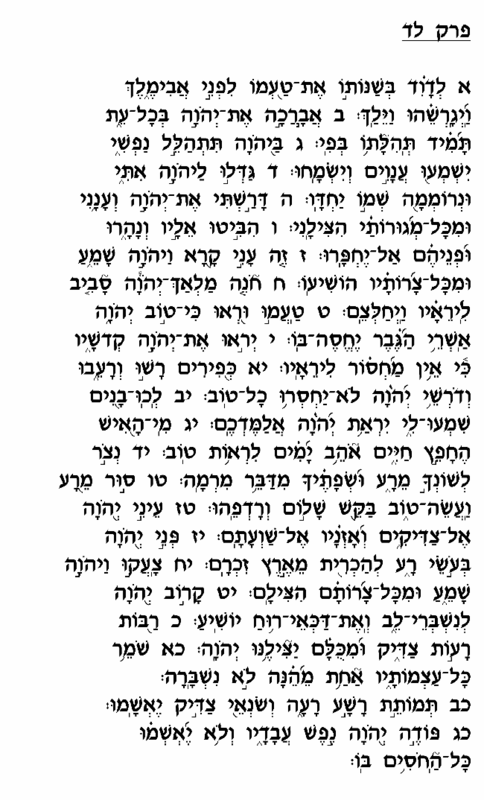 The opening verse of chapter 34 informs us that David composed this Psalm when he feigned insanity in order to escape from the land of the Pelishtim. We read in the Book of Shemuel I (chapter 21) that as David fled from King Shaul, he crossed the border into the territory of the Pelishtim where Shaul would be unable to pursue him. Soon after his arrival in the city of <?xml:namespace prefix = st1 ns = "urn:schemas-microsoft-com:office:smarttags" />Gat, however, the king's servants identified David as an Israelite war hero and urged the king to have him killed. David, fearing for his life, decided to feign mental illness so that the Philistine king would not perceive him as a strategic threat. The scheme was successful, and David managed to safely escape the land of Pelishtim and return to Eretz Yisrael. Appropriately, this chapter speaks of God's responsiveness to those in need, how He rescues the righteous people who turn to him in distress and seek refuge in His protection. Interestingly, although David emerged unscathed from Gat as a result of his own clever scheme, he nevertheless attributed his scheme's success to God's response to his prayers. He uses this opportunity to elaborate on the unique protection and blessing that God affords to the righteous, and how He answers their prayers during times of trouble. David emphasizes that those who embrace a life of piety and fear of God will not suffer or lack anything, going so far as to claim that lions are more likely to experience hunger and food shortage than those who rely on the Almighty (verses 10-11). 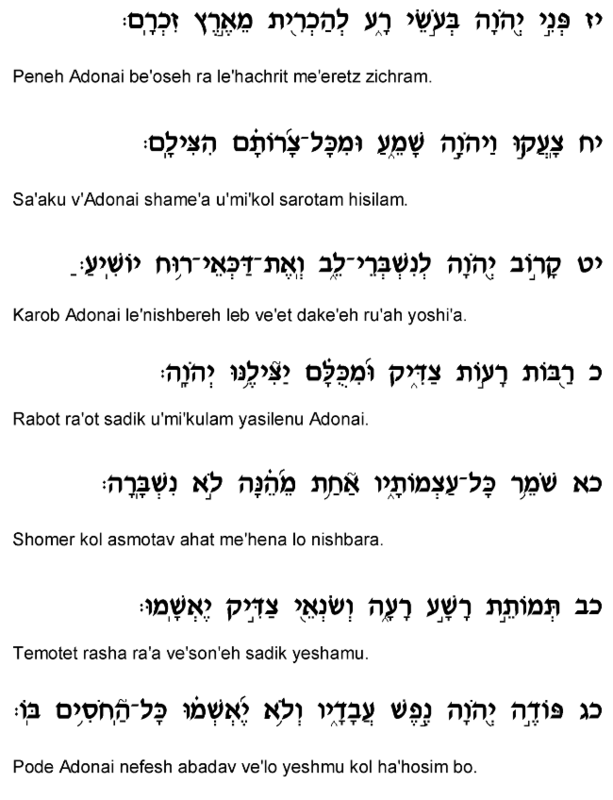 Although the majority of this Psalm deals with this theme of the care and protection God provides for the righteous, it includes a four-verse digression in which David offers guidance towards achieving "Yir'at Hashem" – fear of God (verses 12-15). As the Radak explains, since David speaks in this Psalm of the extraordinary care God grants to those who fear Him, David saw fit to advise us how we can achieve this stature. He instructs that fearing God requires discipline and discretion in speech, action and thought: avoiding inappropriate or hurtful speech, refraining from misconduct, performing Mitzvot, and pursuing social harmony. 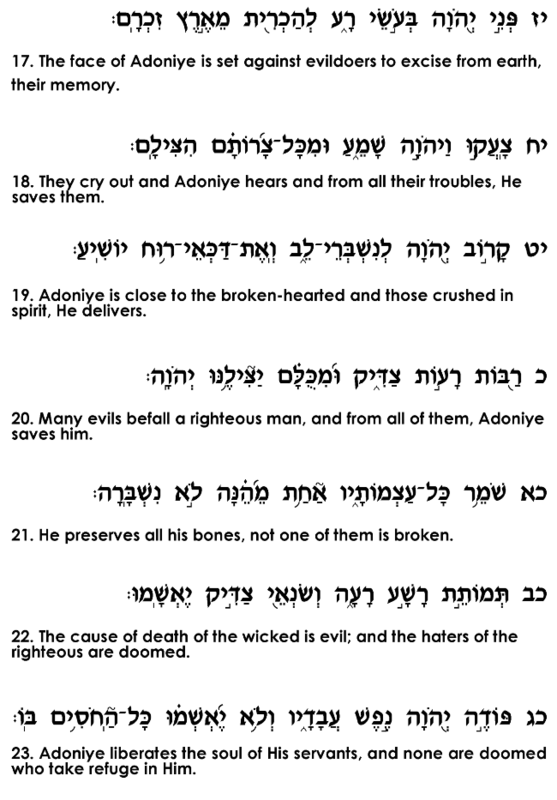 This chapter thus speaks of the benefits of Yir'at Hashem, and of what it means to live of life of Yir'at Hashem. David reminds us here that fear of God guarantees a person protection and blessing, and that fear of God is well within the reach of every individual who is prepared to commit himself to the values and laws of the Torah.